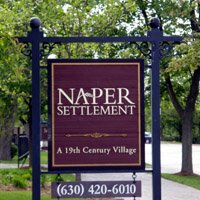 Naper Settlement is a Living History Museum located within walking distance of Naperville's thriving downtown area and Riverwalk. This charming outdoor museum entices visitors to discover Naperville's rich history. as Naperville was being settled, and learn how it changed through the rest of the century. Journey through time as you visit with costumed villagers who show you what life was really like. You may come across them baking bread, shoeing horses, or during Naper Days, putting out a fire with the original hand pumper. 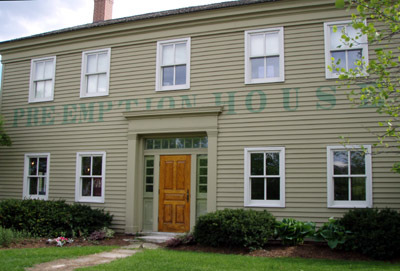 When you enter the village, the first thing you see is the Pre-Emption House. The original building was Naperville's first hotel and tavern and also held the honor of being the first hotel west of Chicago! 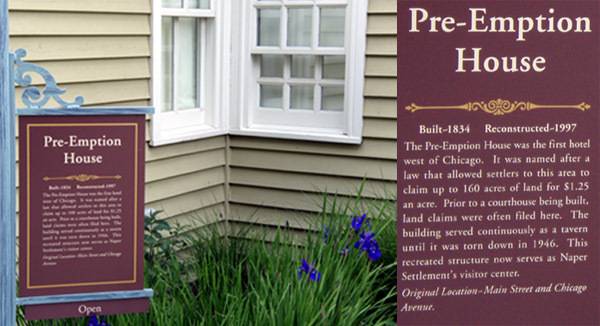 Oral history tells us that Abraham Lincoln addressed local citizens from the roof of the Pre-Emption House when the original building stood in the center of town. Take your time exploring through the village. Visit the the Firehouse, the Schoolhouse, The Blacksmith, and the Print and Stone Carver shops. As you wander down the shady paths, you will see Victorian mansions, carriage houses, and laborer’s homes. It is really like stepping back in time. Don’t miss the replica of Fort Payne…see how the settlers defended themselves when they first arrived in Illinois. Before you leave, make sure you see some of the amazing historical collections! The Les Schroeder Painting Collection is a wonderful illustration by a very talented local artist of life in the Settlement. Collections of historical photos are housed here, as well the Kroehlor Collection…one of the largest furniture manufacturers in the country. Rotating exhibits also inhabit a portion of the Pre-Emption house year round. Don’t miss Naper Settlement when you visit Naperville…it is a wonderful way to immerse yourself in part of our country’s history. The museum was established in 1969 by a group who were trying to save St. John’s Episcopal Church from the wrecking ball. This group was based in the community, and called themselves the Naperville Heritage Society. Long before the Society existed, Caroline Martin Mitchell donated her historic family home and its grounds to the city of Naperville, on the condition that it would remain a museum in perpetuity. The Martin Mitchell home is now a part of the museum, and has been restored to its full Victorian splendor. The museum is closed on New Year's Day, President's Day, Memorial Day, Veteran's Day, Thanksgiving Day and the day after and the week of Christmas.